Hotel Pushp Villa is one of the good budget Hotel in Agra, A 5 minutes drive from The Taj Mahal.Situated near the TAJ MAHAL at walking distance, & having 51 with one Taj Suite Room well-furnished rooms that place you in the lap of luxury, fully equipped with central air-conditioning, Mini-Bar, TV in every room, ultra modern bathrooms with phone and bath tubs running hot and cold water. The view of Taj Mahal has no barrier from the revolving restaurant "Merry-go- Round" even on Friday when the marble beauty tombs is closed for visitors. Providing sightseeing information of Agra. Providing maps and local transportation information. Answering questions about the hotel and its facilities. Arranging transportation to the Airport and Railway Station. Hotel Pushp Villa provides the dry-cleaning services. Clothes dropped off by 10 am. Will be returned by 6 pm. late night service is also available. Clothes dropped off by 11pm will be returned by 7am the next morning. 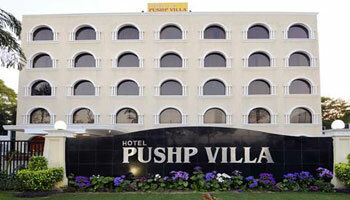 What do you think about Hotel Pushp Villa Agra? Columbas GA Dec 8 2007 : "Nice stay in spite of past reviews..."
When I heard our Indian travel agent had booked this hotel, I looked up the reviews and then sent them to him. He actually took a trip from Delhi to see this hotel when he got the reviews and he took the reviews to the manager. He said the manager was shocked at the comments and had no idea what was being said. This may have done wonders to make my stay nice here, but I review this hotel with a critical eye. We stayed and looked at many hotels in this price range and the rating is in comparison to those hotels, not the five star hotels. Please note that the hotel tries hard to deliver a nice experience, but our fellow travelers ruin rooms by doing things like this or smoking in the rooms. I did not fault the hotel for this, but they do need to do a better job of repainting. The tub appearance is typical of many in India and it was clean although stained. We sprayed everything with Lysol as we did in all hotels. Rottie Auckland Sep 23 2007 : "Oh dear..."
Con Amsterdam Jul 9 2007 : "One word: Terrible!"